I awoke today with this beautiful view before me, and the memories of the whales last night still vividly in my mind. 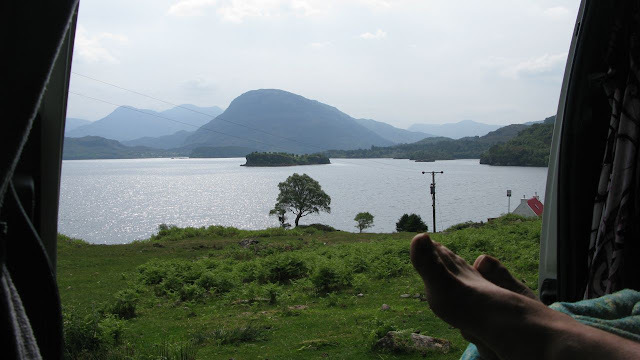 After coffee and a bowl of muesli I was again on the road with Loch Ewe already in mind as my destination. 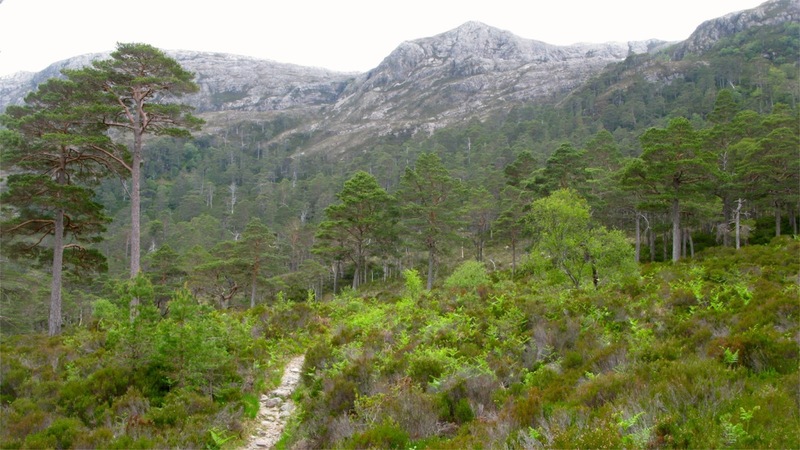 Loch Maree was first to be seen though and I was looking forward to seeing it, knowing its a place barren enough for Sea Eagles to come to rear their young. Loch Maree was a special place to take a walk along the pebbly shoreline, then climb beyond to explore the Scots pine forest above the area is known as the Beinn Eighe National Nature Reserve. I had lunch at a scenic spot further along the shoreline where Scots pine framed a sandy beach, and cooked up a few sausages. I never feel full for very long after a muesli breakfast.. 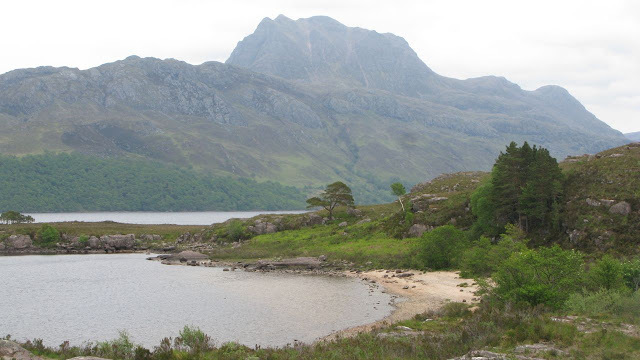 The next place I stopped was at the coastal town of Gairloch, where I took a long walk along the beach. Today I saw the first rain of the trip! The sunny weather had turned to overcast and rainy, but it was refreshing to feel rain on sunburnt skin as I walked in the fresh sea air. 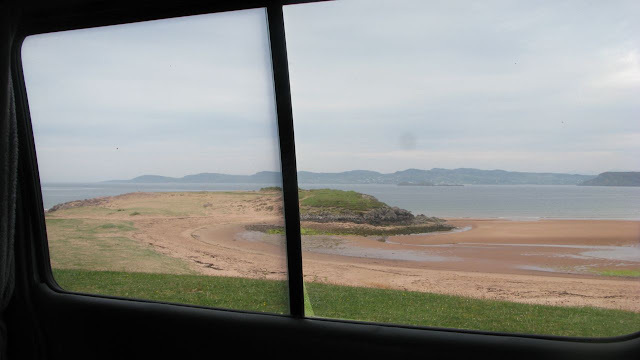 On reaching the head of Loch Ewe, I took a left at Poolewe and followed the narrow road through Naast and Inverasdale until I came to a beautiful beach a bit further on. A sign read that it's fine to camp here with a goodwill charge of £5 per night or £20 per week to help with the upkeep of the area. (No facilities here). First I had to reach the end of the road to see what was at Cove and beyond. Cove itself was a tiny fishing hamlet, and beyond, at the end of the line, was a collection on sentry boxes and gun emplacements from WWII. I enjoyed exploring them and climbing around on the rocks to get the best views. There was deep water here, so it would be an excellent sea fishing location too. 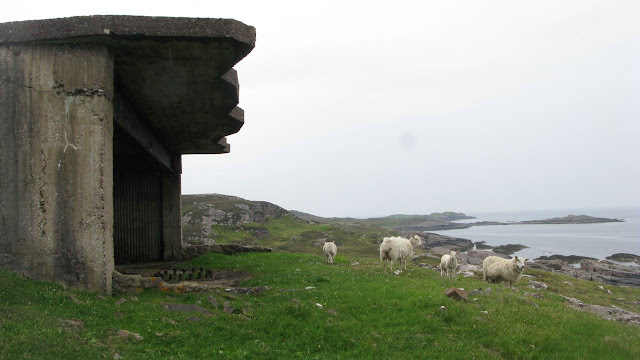 There had once been around 300 soldiers stationed here but now the only residents of the bunkers were some inquisitive sheep. Back at the beach camp spot I found a suitable remote place to stop and relaxed with a glass of wine looking down on the beach below. It was a really calming place - no sounds but the rhythm of the waves and sounds of seabirds. Cooking dinner I watched the tide edging in further and further, and afterwards I was down on the rocks fishing in the deeper water there. It was then that Sarah from Yorkshire appeared with her rod, and I was soon receiving tips and help from an accomplished sea fisher(wo)man. A plan was made to go down to Cove tomorrow where the water is deepest. Now, catching some bigger fish was becoming more of a possibility..